In an era of non-expandable laptops, the Digital Storm Equinox invites you to open it up and tinker. Digital Storm might not be a household name, but as a PC manufacturer it’s made some of our favorite desktops over the years. The latest laptop from Digital Storm, the Equinox, promises to live up to thatht pedigree with the help of some very impressive hardware. Featuring an Intel Core i7-8750H processor, 16GB of RAM, an Nvidia GeForce GTX 1070 Max-Q graphics card, with 500GB of storage space and a 1,080p, 144Hz display, the Digital Storm Equinox comes dressed to impress. 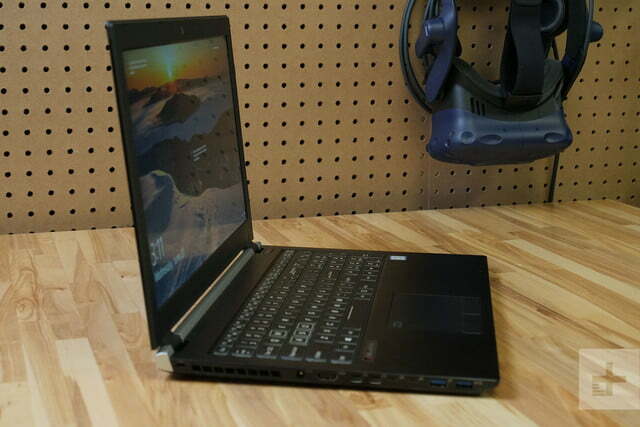 It will run you $1,875, but there’s more to this laptop than meets the eye. It’s not easy to manufacture laptops. The supply chain needed to make and sell a fully-custom laptop at scale is truly massive, add on top of that the additional research and development budget needed, and it’s clear why smaller companies have trouble manufacturing their own laptops. 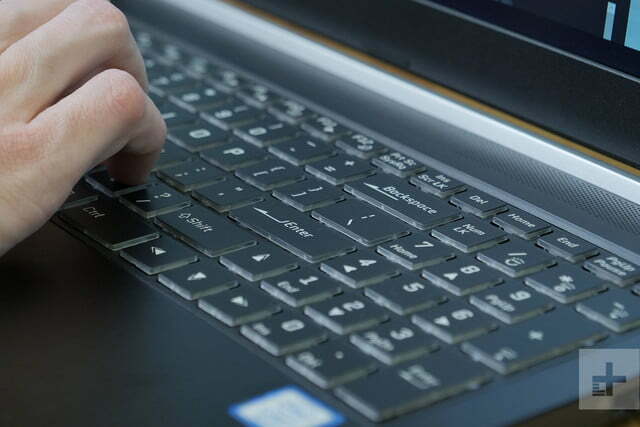 Because of that, it’s not uncommon to see manufacturers go with off-the-shelf laptop components with external customizations like a new logo sprayed on the back, or a branded sticker on the interior. There’s nothing wrong with the exterior design here, it’s just a bit dated and one-size-fits-all compared to the bespoke craftsmanship you get from bigger manufacturers, which have the resources to design and produce custom laptop bodies. That said, there are some advantages to going with an off-the-shelf chassis like this one. 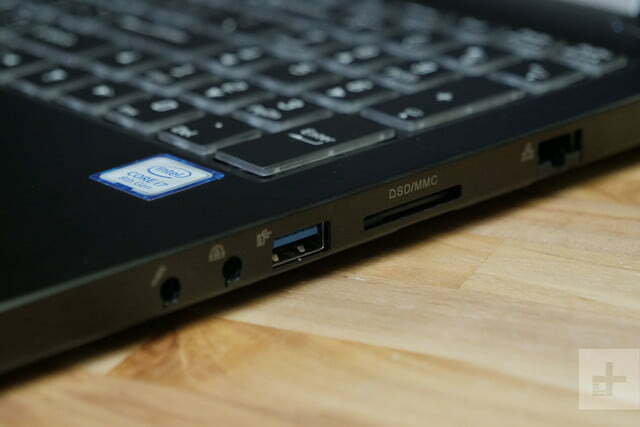 If you pop open a Dell or Asus gaming laptop, you’re not guaranteed to find anything inside that can be replaced or upgraded by the user. 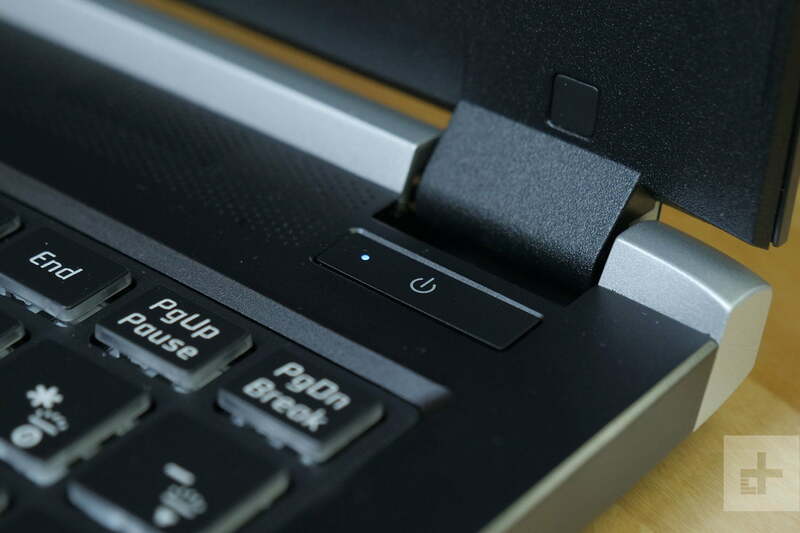 Most laptops from big manufacturers are designed as closed systems, often times not much more user expandable as your smartphone is. More and more often, RAM and storage are soldered to the motherboard in these systems, so you can’t really pop anything in or out. There’s one big advantage to going with an off-the-shelf chassis like this one — the ability to upgrade over time. That’s where the Digital Storm Equinox gets a leg up on the competition. Just remove eleven screws from the back panel and it pops right off. Inside, you’ll find two RAM slots — occupied by a pair of 8GB sticks for a grand total of 16GB of RAM — a full-sized M.2 slot, so you can expand or replace the stock 500GB SSD in there. Plus, there’s a vacant drive bay that would fit a SATA hard drive. 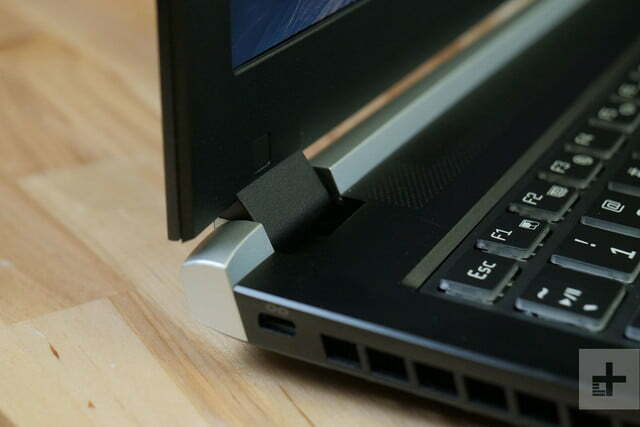 To be fair, the Razer Blade 15 also features a replaceable M.2 drive, and replaceable RAM, and that’s great for anyone who wants to lowball the configuration and expand later. But the Equinox has the advantage here on account of that vacant drive bay, and the fact that it’s made from off-the-shelf components so you could feasibly replace just about anything on the inside — if you don’t mind getting your hands dirty. 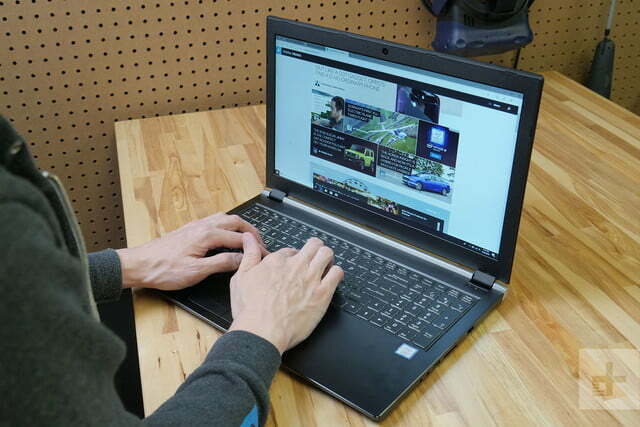 Even though the Equinox doesn’t have quite the same level of fit and finish you’d find in a gaming laptop from a bigger manufacturer, it does feature a surprising degree of expandability, so this is a machine you’re going to be able to change over time. Not the major components like the GPU or CPU, but there’s room here to upgrade the storage or replace the RAM over time, and those are options you don’t see very often anymore. Looking at the Digital Storm Equinox, you might notice that the ports are in unusual locations. They’re slid a little further forward than they might be on other laptops. That’s because of the massive graphics card on the inside, the Nvidia GeForce GTX 1070 requires a lot of space, and a lot of cooling. So the ports have been relocated to accommodate cooling vents and some complex internal topography. It features a single USB port on the right side, along with a headphone and microphone jack, an ethernet port and an SD card slot. On the left side, it features two USB-C ports, two more USB-A ports, an HDMI port, two mini DisplayPorts, and the power port. We appreciate that this laptop has more ports than its competitors, especially as we’re starting to see the number of ports dwindle in favor of lighter and slimmer-bodied laptops. The Equinox manages to make the most of its 144Hz display by keeping the resolution down to a reasonable 1080p. The keyboard and touchpad both feel responsive, which is impressive for an off-the-shelf chassis. 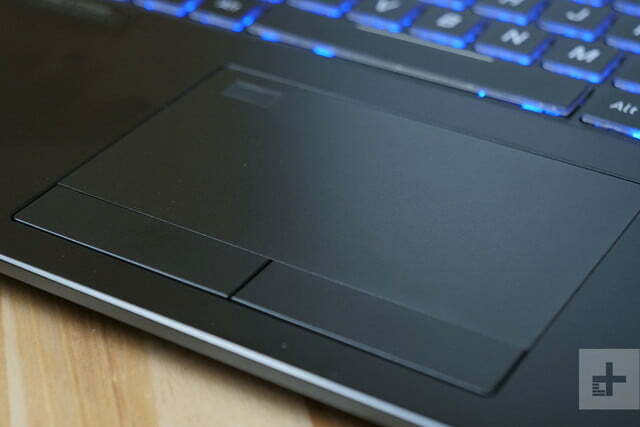 The fingerprint sensor embedded in the touchpad didn’t give us any trouble when we used it to login to Windows, and the touchpad itself feels appropriately slick and smooth. 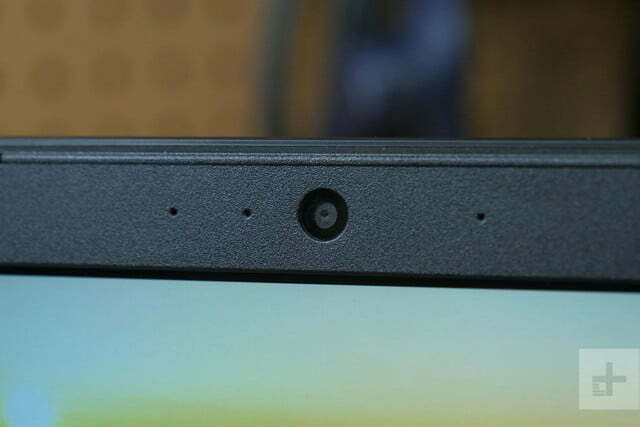 However, it’s very clear this touchpad is metal instead of glass, which we’ve been seeing more commonly on premium laptops. It doesn’t have that sanded-smooth feel we’ve become accustomed to. Typing on the Equinox’s keyboard feels great. The keys are a tiny bit mushy, but they’re springy and feature a surprisingly deep keystroke. 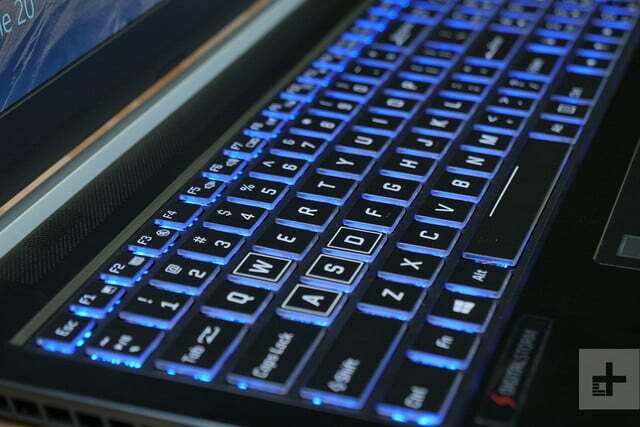 Additionally, the keyboard boasts RGB lighting customizable via included software. There is a bit of light bleed, but it’s intentional because the keys are transparent with opaque black caps on top. It’s a nice effect. In the dark the keyboard looks positively luminescent. Under bright lights, it’s less impressive, but still clearly visible. The Digital Storm Equinox features a 144Hz 1080p display, which is a good fit for its gaming hardware. The GTX 1070 is a powerful graphics card, but few laptops can handle gaming at 1440p or 4K while still hitting the 144 FPS necessary to take advantage of a 144Hz display. Some can, but it’s rare and comes at a cost — these laptops are typically very large and very expensive. The Equinox manages to make the most of its 144Hz display by keeping the resolution down to a reasonable 1,920 x 1,080, rather than a more ambitious 1440p or 4K max resolution. On top of the refresh rate, the Equinox is an unassuming workhorse. The display is sharp and vibrant enough that you’ll never think twice about it. Games are fluid and colorful, with deep, dark shadows and bright, rich highlights. As you can see in our benchmarks here, the Equinox features a slightly low contrast ratio of 470-to-1. to Colors are bright, shadows are dark, all without losing definition in between, but side-by-side with a higher-contrast display and there’s a clear difference. It’s the tradeoff you get when you opt for a high-refresh-rate display though. The color accuracy isn’t quite as high as you might want, with average color error hitting 2.56. That might be a problem if you’re doing intensive photo or video editing, but during everyday use it’s low enough that you won’t notice. The display manages to hit 95 percent of the sRGB color space, and about 71 percent of the more finicky AdobeRGB color space. 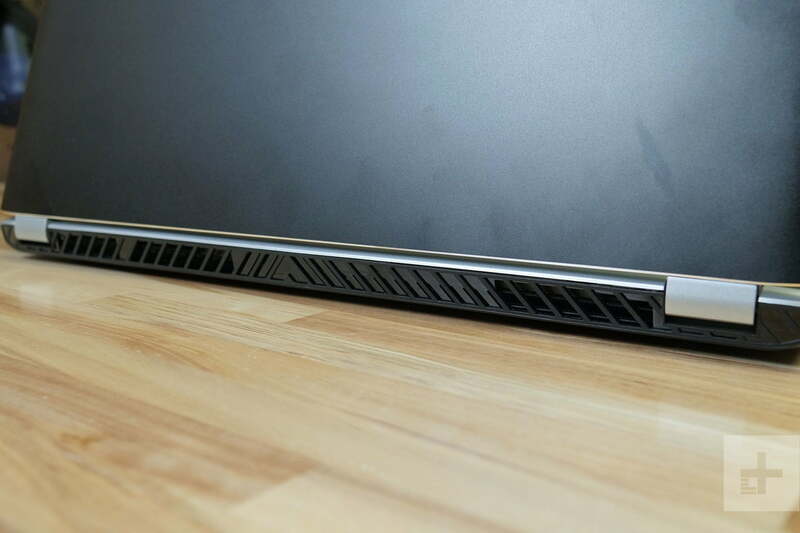 That’s about what we’d expect from a 144Hz display on a gaming laptop, and it’s right around what we saw on the Alienware 17 R5. Powered by an 8th-generation Intel Core i7-8750H processor, the Digital Storm Equinox just flies through most everyday tasks. 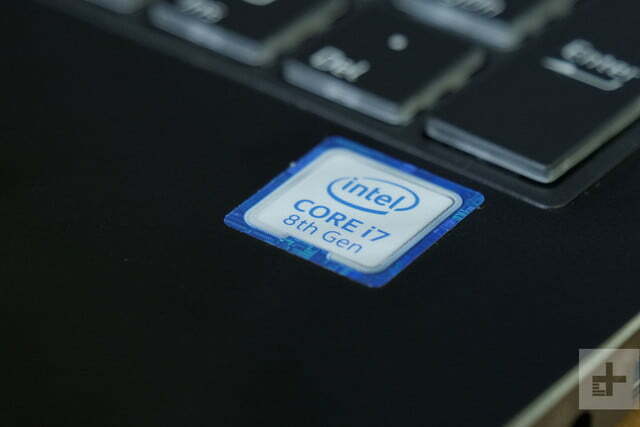 With its six-core architecture, the Core i7 handles complex multi-tasking with ease. We never experienced any slowdown even when we had several processor-intensive applications running at the same time. The extra speed you get out of those six cores is helpful for everyday tasks and productivity suites — Adobe, Microsoft Office, and the like — but it’s not as important for gaming as your graphics card is. So, keep in mind you can get away with a Core i5 in most gaming laptops and a Core i7, like the one in the Digital Storm Equinox, is a little overkill unless you’re going to be doing a lot of work in Adobe Photoshop or Premiere Pro. Looking at how the Core i7-8750H stacks up to competitors here, you can see that it falls right between the 7th-generation Core i7-7820HK and the latest Core i9-8950HK. It’s a perfect example of what you get out of these three processors and how they differ. Even under heavy load, running a game at max settings for a few hours, it warms up but never gets hot. The Core i7-7820HK is quick and nimble, but it’s only a quad-core processor. The Core i9-8950HK is just about the most heavy-duty processor you can get on a laptop today, and its scores illustrate that marvelously. We see a similar distribution in multi-core scores, with the Equinox coming in right in the middle of the lower-end Core i7-7820HK and the higher-end Intel Core i9-8950HK. Looking at our other performance metrics here, we see the same distribution across the board. If nothing else it’s an excellent reminder that Intel’s chips are very consistent. In our Handbrake benchmark for instance, the Core i9 finished it up in a little over five minutes, while the Equinox and its 8th-generation Core i7 finished it up in just over six minutes. The Digital Storm Equinox ships with a 500GB Samsung 960 EVO M.2 SSD, which is an absolutely killer choice. We’ve tested them before and they’re typically very quick, the one in our review unit was no exception. This thing is one of the best SSDs on the market, and it comes standard on the Equinox. With read and write speeds over 1 gigabyte-per-second, you’re never going to feel bottlenecked by this SSD. Moving big files from one place to another is a breeze — but that’s not it. This little drive has one more trick up its sleeve. We touched on this a little bit earlier, but the fact that the Digital Storm Equinox has a removable M.2 drive is unusual in a very good way. The Samsung 960 EVO SSD is a great storage solution, but if you’re going to need more space in the future, stepping up to a one or two terabyte drive, you have a few options with the Equinox that you don’t in other laptops. You can pop it open, remove the Samsung 960 EVO M.2 drive, and replace it with any other M.2 drive. 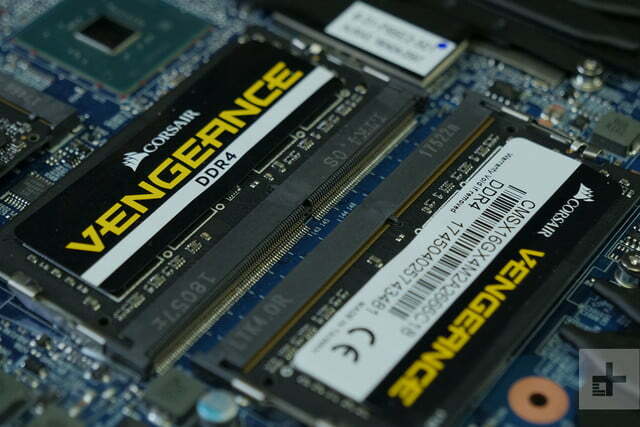 Similarly, the empty SATA slot inside the Equinox would fit a 1TB mechanical drive or SSD perfectly. 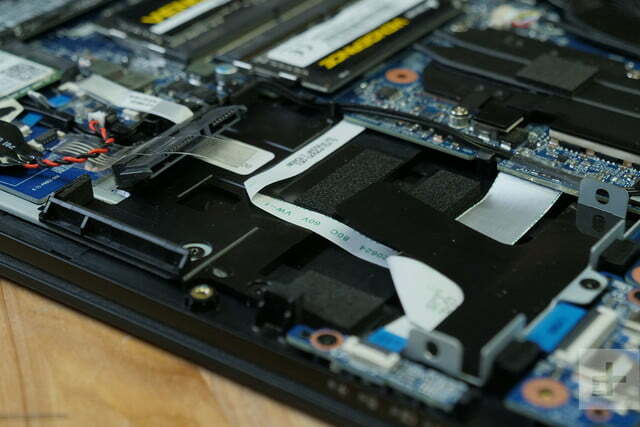 So, even if this laptop doesn’t have quite enough storage space for your liking, it’s easily expandable, so you DIY-ers out there can upgrade the storage significantly with the removal of just a couple screws. The Nvidia GeForce GTX 1070 is a very powerful graphics card, but it has a bad habit of running hot, especially in laptop systems. The version inside the Digital Storm Equinox is a Max-Q version, so it’s been underclocked. That means it isn’t quite as powerful as a non-Max-Q version but produces less heat and requires smaller fans. In the Digital Storm Equinox, the heat-mitigation properties of the Max-Q graphics card are very apparent. Even under heavy load, running a game at max settings for a few hours, it warms up but never gets hot. Aluminum laptops like the MacBook Pro, Razer Blade, and even the Asus Zephyrus, tend to heat up and become uncomfortably hot to the touch. Thanks to the plastic back plate, the Equinox doesn’t have that problem. Looking at our benchmarks here, you can see that the Max-Q GTX 1070, underclocked though it is, manages to keep up with its competitors without too much trouble. The GTX 1080 in the Alienware 17 R5 leads the pack, but that’s to be expected. Looking at the Razer Blade 15, which also features a Max-Q GTX 1070 graphics card, you can see that the Equinox is coming well within striking distance. It’s unclear if the Razer Blade benefits from some unseen advantage here or if it’s just the natural variance you’re going to see between graphics cards — even graphics cards of the same type. But it’s important to point out that the Razer Blade 15 doesn’t blow the Equinox out of the water, it’s a very close race. That’s impressive since the Razer Blade 15 will run you about $800 more than the Equinox. 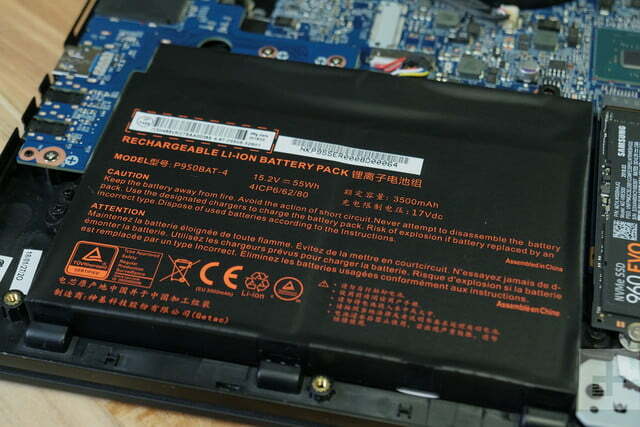 Here it is, the Achilles’ Heel of most gaming laptops: Battery life. 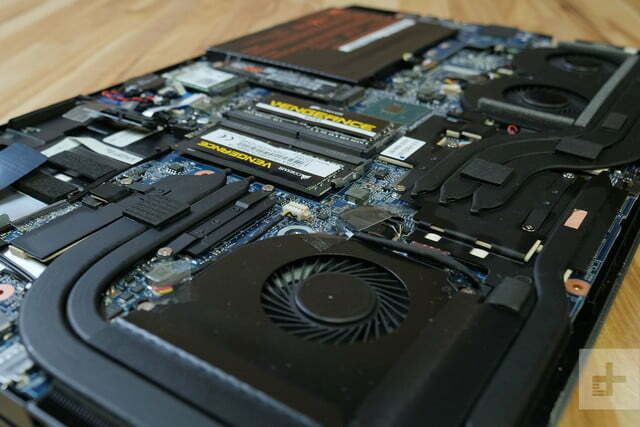 Running powerful hardware requires a lot of power, so even average-sized laptop batteries will often find themselves overburdened by gaming-grade hardware. That’s certainly the case here. 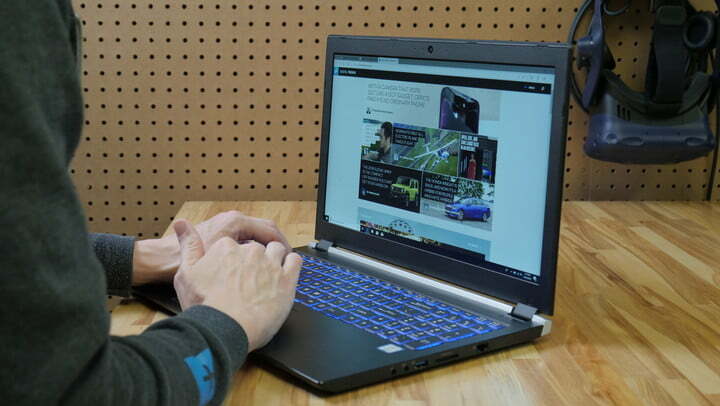 The Digital Storm Equinox offers decent battery life for a gaming laptop, but it’s probably not going to last an entire workday. You might make it to lunch if you’re just doing some Microsoft Office work, or some light photo editing, but you’ll probably want to make sure you bring your charger anywhere you go. That’s par for the course for gaming laptops. Looking at these battery benchmarks, you can see that some of the heavier-duty gaming laptops will last a bit longer on our tests, but for the most part they land in the same range. The Equinox for instance managed to stay alive for about three and a half hours in our video loop test, that’s not bad for a 54-watt-hour battery. It fell just short of the Alienware 17 R5 which managed about 20 minutes longer on its 68 watt-hour battery — and more power-hungry hardware. That being said, some other gaming laptops such as the Razer Blade 15 outperform the Equinox by a significant degree here, hitting over 7 hours of battery life on our video loop test. That’s an impressive result and a clear indicator of what you get when you opt for a premium laptop. The Blade is more expensive than the Equinox but you get quite a bit more mileage out of its battery. The Digital Storm Equinox is something of a contradiction. It’s an expensive gaming laptop, but it’s less expensive than similarly outfitted competitors. It’s well-built but not well-engineered, it’s thin but not exactly stylish. However, you’ll be hard-pressed to find this kind of performance at this price point, and for plenty of people, that’s exactly what they want. The answer to this question changes depending how you’re looking at the Equinox. 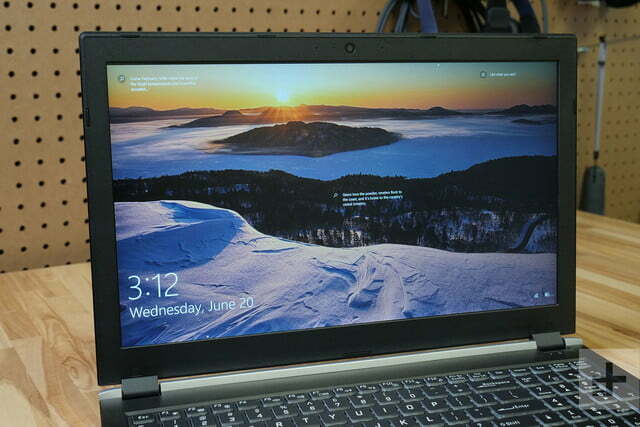 If it’s the most expensive laptop on your list, then it’s an excellent deal. 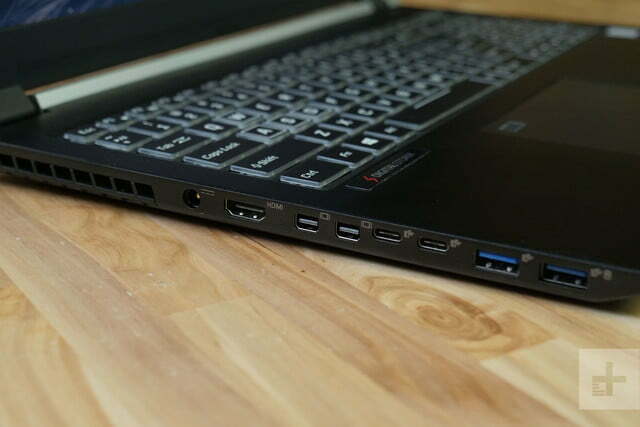 You are not likely to find another laptop with this hardware or performance level for a lower price. 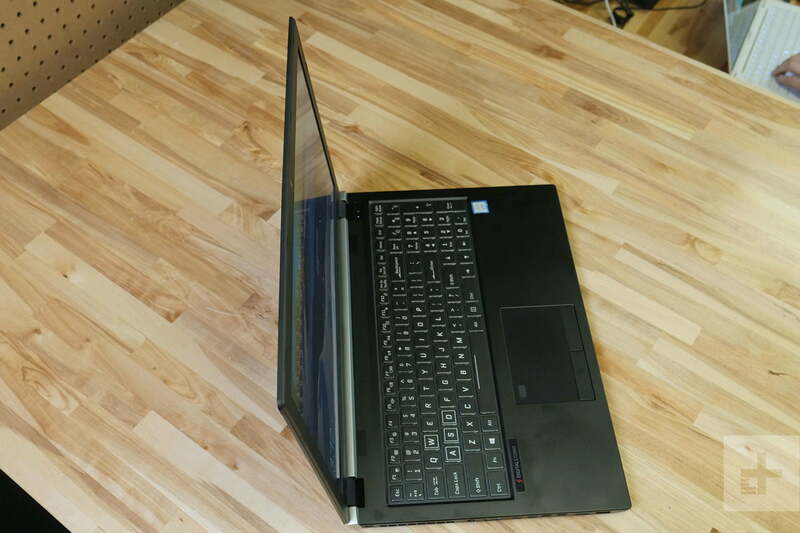 The MSI GS65 Stealth comes close, offering similar specs for only a marginal price increase. Similarly, the Gigabyte Aero can be outfitted with the same hardware if you don’t mind paying an extra $500 for a sharper chassis. 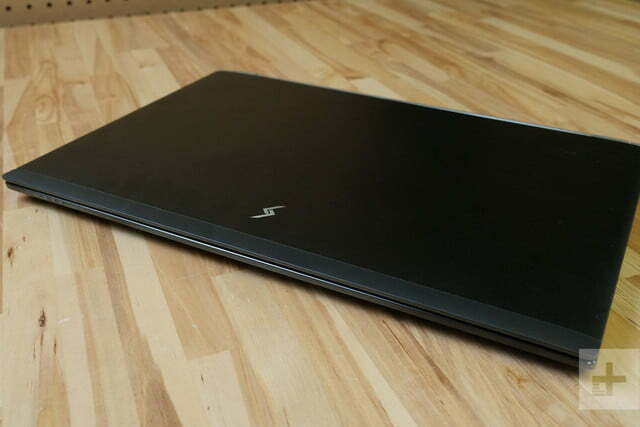 That said, if the Equinox is the least expensive laptop on your list, you can find this combination of components in a much more attractive and premium chassis. 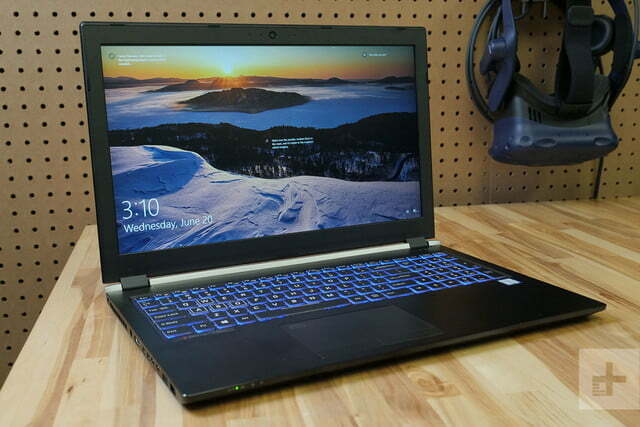 The Razer Blade 15 for instance offers a classy exterior design, and better battery life when compared to the Equinox — but it’s going to run you about $2,600 for the same specs as the Equinox. There’s also a third angle: If you miss the days of expandable laptops, the Equinox could be the machine you’ve been looking for. You can open it up, upgrade its storage, tinker with its components much more easily than you can with other laptops. That alone gives it an advantage over the competition, if you don’t mind popping this thing open. The Equinox features a powerful six-core CPU from Intel’s latest processor generation, and a high-end graphics card that will handle just about any modern game you can throw at it. On their own, these components will keep the Equinox relevant and competitive for at least a couple years, and its greatest shortcoming — storage space — is easily fixed thanks to a full-size M.2 port on the interior of the machine. 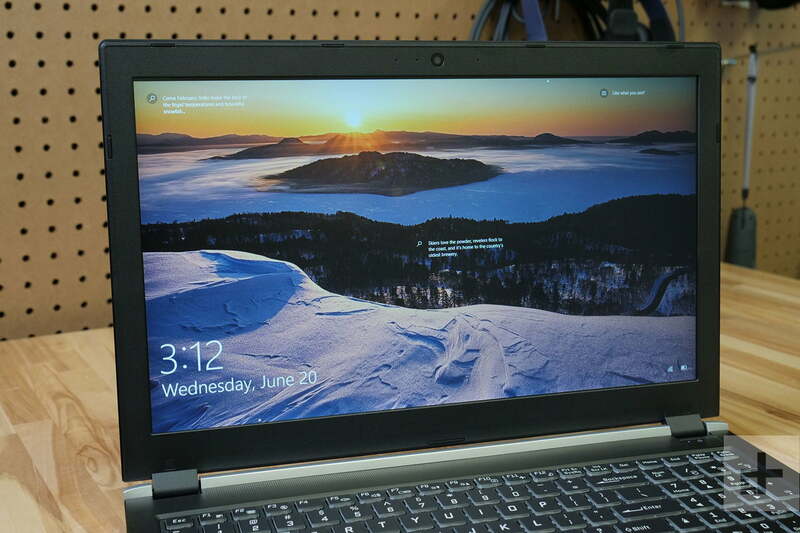 This is a laptop that begs to be user-customized, tinkered with, and upgraded over time. The Digital Storm Equinox also ships with a three-year limited hardware warranty, just keep in mind that you might void that warranty if you crack it open to change its internals. Yes, absolutely. At $1,875 it’s not cheap, but it’s is less expensive than similarly-outfitted gaming laptops from Razer, Asus, and Dell. Not to mention, if you’re not intimidated by opening up a laptop to upgrade its components, the Equinox is an excellent choice. That said, if you’d prefer a laptop with a svelte-and-stylish chassis, it might be worth spending a little extra to pick up the new Razer Blade 15 — or scale down your gaming needs and settle for a Dell XPS 15 with a GTX 1050.